Line two large baking sheets with silicone liners or parchment paper. Cut off the top of the head of garlic, brush with 1 teaspoon of the olive oil and sprinkle with a pinch of the salt. Wrap in parchment paper, then foil (to allow the garlic to steam and not burn, and to reduce aluminium transfer). Place on one of the baking sheets. Toss the butternut squash, carrot, and onion in the remaining olive oil and 1/4 teaspoon of the salt and spread out on the prepared baking sheets. Once the garlic and vegetables have roasted, allow them to cool slightly. Squeeze the garlic pulp out of the peels. This should yield about 2 tablespoons of roasted garlic. While the vegetables are cooking, steep the cilantro root in the broth in a large saucepan. Transfer the roasted garlic and vegetables to the saucepan with the broth, and add the coconut milk, minced ginger, and remaining 3/4 teaspoon salt. Bring the mixture to a boil, and then reduce the heat to medium-high, and simmer, partially covered, for about 15 minutes to allow the flavors to infuse. Remove the soup from the heat and allow the soup to cool slightly. 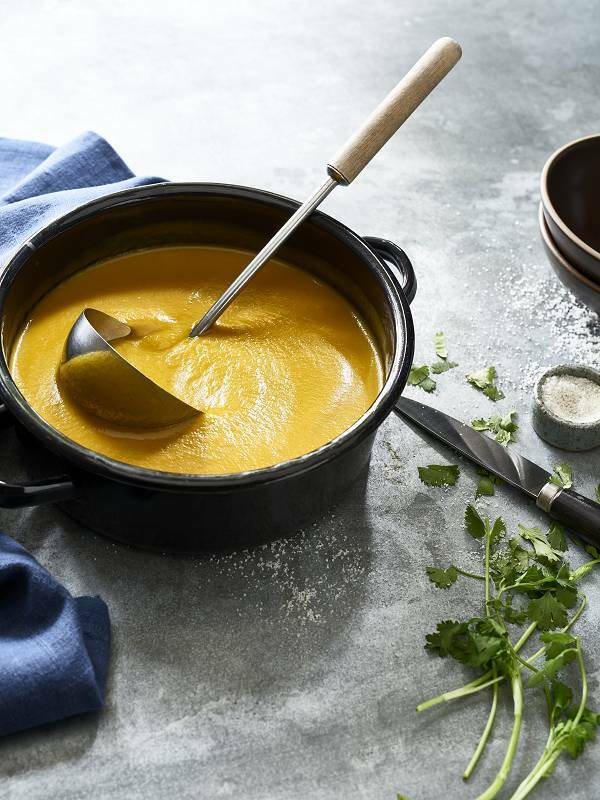 Pour the soup into your blender in batches and puree on high for 30 to 60 seconds, until smooth and creamy. (For conventional blenders, remove the small center lid cap and cover the opening with a kitchen towel so steam can escape while you blend.) Return the soup to the saucepan, season to taste, and warm it over low heat. Add maple syrup to taste, and season with salt and pepper to taste. To serve, ladle the soup into bowls and garnish with a sprinkle of chopped cilantro leaves.